Between them, Helene Hugel and Marie Brett have long and varied experience of working as artists in a range of healthcare settings. Here they consider the notion of arts and health as an arts practice and reflect upon some of the challenges of sustaining artistic vision and integrity across different projects while building meaningful relationships with partners and participants. As an artist working with children and young people in arts and health since 2002, I have come to believe that a sustainable and progressive arts and health practice for artists requires constant attention to and minding of the relationships between multiple stakeholders and their narratives. By narratives, I refer to the experiences and perspectives of stakeholders involved in any one project. Some of the possible narratives at play in arts and health include: the narrative of the health service and their institutional routine; the narrative of the patient’s participation in the art project; the key staff members’ experience of the project; finally, the artist’s longterm ambitions and vision for their arts practice. When brought together within an arts and health project, these narratives can compete with each other and cause tension. For example, a child is participating in a puppet-making workshop facilitated by an artist in residence in a children’s hospital. The child’s work is interrupted by hospital staff and the child is taken for an X-ray appointment. Another example: a participatory art project’s aim in a children’s hospital is to create a final piece of artwork with the children by the end of a six-week residency. However, each week the artist visits, the group of children are different, with perhaps one or two consistent participants. How can an artist work to maintain a perspective of consistency in the arts and health environment which is, by its nature, transitional? The role and responsibility of professional artists is to achieve artistic outcomes. Artists working in healthcare settings also have responsibility for the welfare of the patient participant during their experience of the art project. If there is no meeting point between the patient’s perspective and the artist’s perspective, the project is unlikely to reach its full potential. It is also at risk of becoming either completely arts outcome focused, where the needs, response, and input of the patient participant is ignored and subjected to the artist’s aims; or it is at risk of losing the integrity of the arts practice, and the artist becomes a vehicle for achieving purely therapeutic and clinical outcomes. A disconnect can develop between the artist’s practice and the context in which they work. This in turn can limit what the artwork can become; it can limit the artist’s development; and it can limit the impact on the participant. Without a method of making visible, acknowledging and negotiating with the multiple stakeholder perspectives, arts and health risks becoming ‘stuck’, unprogressive and less effective. Accepting a singular stakeholder view interrupts innovation and causes repetition of stale methods, which will not help the artist to learn or develop their practice or for the service to improve for the patient. What helps to bridge this disconnect? If the perspective is taken that arts and health is an arts practice in its own right, the field becomes unstuck, dynamic, and able to move between the multiple narratives. What does this mean for the artist? Any participatory or collaborative arts practice requires passion and vision and a sense of rigour. It also requires the ability to be able to clearly communicate this vision to the communities we work with and, in turn, develop a shared vision for a project. For any artist, it takes time for this vision to develop and passion needs to be fed. It is not easy to answer the question, ‘Why do you do what you do?’ However, once the time is invested in doing so on a regular basis, the vision helps the artist to maintain their own narrative across their multiple projects. The vision also helps the artist to define how they negotiate the multiple stakeholders within health settings; what creative processes they employ; what aspects of the project are exploratory and which are methodical. For example, how can artists structure a project so that the participant who attends for one session has just as complete an experience as the person who attends for three sessions? The invention of this structure becomes in itself a creative process. Some artists need designated space to explore and develop their vision. Some use a studio space, some a journal, some the expertise of a mentor. All are very useful to employ within the structure of an arts and health project. Artists need quality time and space to understand, reflect, and react to the multiple narratives at play in arts and health in order to develop their practice so that it is sustained and grows from project to project. This in turn improves the experience of the patient and the experience of the health setting. Resources and structures need to be negotiated with funders, commissioners and partners to create and protect this time and space so that best practice in arts and health is developed over the working lifetime of an artist. Helene Hugel is the Director of Helium, an arts and health organisation serving children, their families and healthcare communities nationwide. Boundary slippage: an SOS for artists integrity? This article considers the given idea of ‘arts and health as an arts practice’ and aims to position my response in relation to key influences which have informed and shaped my own practice within the field. When asking: What is arts and health? The Arts Council (1) define it as ‘a complex area of practice that involves a diverse range of a stakeholders, each with their own aims, objectives, priorities and approaches’. This conjunction of professions is critical and I will revisit the point later. My understanding of arts and health is that of a Littoral Zone, a geographic term for the inter-tidal, ever-shifting interface of land, sea and air. In this instance, the interface is replaced by service providers, service users and artists. I propose that working in such a place of flux can prove personally and professionally challenging for artists; it can be a place of uncertainty, anxiety and disorientation and potentially a place of beguile and distraction. Of course the very nature of this context is all the more reason an artist would want to engage with it. Grant Kester (2) in writing about Littoral Art says it is interdisciplinary, operating ‘between discourses and between institutions’. For me, arts and health is a three-way interface certainly rooted in discursively mediated encounter, and the practice necessitates artists’ ability for discursive engagement. There are challenges though to such discursivity born from the three-way interface and conjunction of two distinct professions centralising around issues of expectation, status and power. As an artist, I seek opportunities to make work currently exploring the notion of ambiguous loss. This is a conceptual concern existent across various contexts; the challenge for me is to locate meaningful exchange to cross inform and influence a creative exploration and outcome. Within an arts and health context, I have to be mindful of the often contradictory complexities of the practice and remain cognisant of my priorities as an artist having primary regard to the artwork and its conceptual enquiry. While certainly adopting a listening carefully, participant-centred approach with wellbeing priority embedded, the notion of an engagement primarily serving art can still be a challenging position to secure and hold. It may be useful at this stage to outline what ‘I am not’ as a device to further laterally define what ‘I am’… Engagement for me is neither educational or pedagogic, not being involved in therapeutic or correctional interaction, my practice is not at the service of a healing agenda although it may be claimed by others as an aligned consequential outcome. This index might appear dogmatic, perhaps a consequence of Littoral Zone practice which does require clarity of intention to capacitate vigorous partnership and prevent beguile by other worthy agenda. Aiming to explore my practice in relation to arts and health further, I refer to a few key projects. 7 Shadows is an ongoing collaboration with Nic Piper; an arts intervention referencing the ex-voto where active engagement and invited consequential production is a fundamental part of the work as apposed to passive consumption. 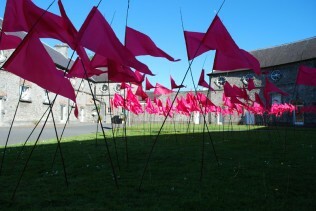 The work is installed in unlikely settings and may raise debate as to contextual alignment with arts and health; referencing this, Dr Ronan Foley (3) in writing about the work said ‘One can see in this ephemeral artwork a strong connection to geographical research on therapeutic landscapes. The site becomes a setting into which passing bodies release a wide set of anxieties, hopes, dreams and needs. In so doing they perform an act of unburdening which is in itself therapeutic.’ The work is intimate with engagement often revealing and deeply personal, while conversely the work also occupies the anonymity of the collective. By comparison Amulet was an action research project based at Cork University Maternity Hospital exploring the concept of the amulet as an object signifier of ethereal farewell specific to pregnancy loss. Fragile, discursive engagement formed the bedrock of the work resulting in a physical non-entity, which as Grant Kester argues challenges us to accept the process as an inherent part of the work, all be it invisible. For me, this argument is significant to understanding meaningful arts and health practice, according invisible dialogue with status. Claire Bishop (4) referring to the discourse around socially engaged art practice warns that the ‘conceptual gesture of reducing authorship to the role of facilitation ultimately leaves little to distinguish projects from a slew of community-based practices that revolve around a predictable formula.’ Her response to art criticism’s tendency of evaluating collaborative work in ethical rather than aesthetic terms, focusing more on ‘how’ rather than ‘why’ has, she says, resulted in reducing art to ‘moral criteria’. The notion of moral criteria interests me and in collaboration with art therapist John McHarg was explored through ‘Reverie: Locating Loss’ an action research intervention. Exploring issues of power, obligation and authorship through gift economy, the work included art therapists’ participation, while challenging art therapy paradigm prioritising clinical outcomes as the primary goal of encounter. The work invited physical response as a gift to inform a newly re-positioned work at some point in the future. Moral criteria as a concept was explored through dialogue with participants prior to engagement. In wrapping up, I suggest a need for those of us engaged in arts and health practice to further interrogate Bishop’s warning, as the argument of ethics verses aesthetic brings into question the very crucial issue of artist’s integrity within the field, and this certainly is worth further exploration. Marie Brett’s practice spans video, sculpture and installation as well as participatory public art and in-context projects. She has realised many arts and health projects.